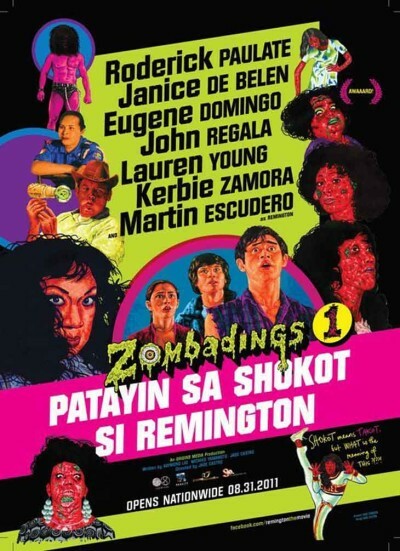 "Zombadings 1: Patayin Sa Shokot Si Remington" does not do anything to curb the blatant trend in local indie films. It has always been a topic between our friends - independent films in this country also suffer the same fate as our mainstream films. As romance, comedy and drama (or a combination of all of these) are to local mainstream films, homosexuality is for local indie films (or at least those being shown in mall theaters). In this regard, we can say that "Zombadings" does not reinvent the wheel. But here's the catch - "Zombadings" actually dares to be creative and not be a sell-out. It actually has the guts to find new avenues, fun and hilarious at that, to show the message repeated over and over again in local indie films. "Zombadings" is a classic par none and it showcases the talent and imagination our filmmakers definitely have but rarely shown on the big screen. Fifteen years ago, Remington was still a young boy and he always liked to berate at gays. One day at the cemetery, he berated a crying gay and out of anger, the gay put a curse on Remington - that someday he too will turn into a homosexual. Today, Remington (Martin Escudero) is all grown-up, lives in the town of Lucban and very far away from being gay. The town has also been hit with a series of bizarre murders whose only targets are homosexual men. On one of the crime scenes, Remington meets Hannah (Lauren Young), a young girl whom he feels attracted to immediately. Remington soon has imaginary visions of a "man" attacking him and each time this happens, it seems as though that a part within himself is changing into a homosexual. Is this the curse becoming true and if so, can the town's homosexuals survive the mysterious murderer? "Zombadings 1: Patayin Sa Shokot Si Remington" is crazy, insane and ludicrous at times and these are the same reasons it is so damn good. What we really liked about "Zombadings" is that it never takes itself too seriously. Let's be honest here - empowering statements and jabs from these indie films usually come out forced and not palatable to most of the mainstream crowd. "Zombadings" just showed everyone how to do it. No naked men dancing around having orgies or what-nots and yet, we still got the key messages it wants to say. The casting of the film was another bright gem. Everyone just fell into place but props to Martin Escudero. The transition from a typical young male to a cursed homosexual was not only hilarious but also natural. While the film did have minor hiccups in some scenes (some quips just felt unnecessary), it is a polish film at that. Scenes looked consistent all throughout and quality is way better than the usual we get even from mainstream films. "Zombadings 1: Patayin Sa Shokot Si Remington" uses a medium that usually no one takes seriously but ironically, with this same medium it has earned respect. Not only respect as a film but also to the issues it tries to tackle. We can definitely say that if this film's purpose is to spread its empowering message to as many ignorant people out there, then it did its job flawlessly. Bravo!